"We are once again thrilled to support Race to Green this year with Mobil 1 Annual Protection, which helps reduce used oil and enables cars to go longer between oil changes." CHARLOTTE, N.C.--(BUSINESS WIRE)--The Mobil 1 brand announced today that it will begin its fourth consecutive race season as an official technology partner of NASCAR® Green. This year as part of the NASCAR Race to Green™ initiative, the brand will highlight its latest product, Mobil 1TM Annual Protection motor oil, which allows drivers to go one full year – or up to 20,000 miles – between oil changes. On April 21, Danica Patrick, driver of the No. 10 Ford, will help convert the motor oil on an American Medical Response branded NASCAR safety vehicle at Bristol Motor Speedway to Mobil 1 Annual Protection in recognition of the full NASCAR-owned track safety fleet converting to this cutting edge lubricant. AMR is the “Official Emergency Medical Service Partner of NASCAR®,” providing doctors and paramedics ready to respond immediately to any on-track incident that occurs during a race. To showcase the low environmental impact of Mobil 1 Annual Protection, the brand has created an infographic that will be unveiled by Patrick. For the weekend’s race fans, the infographic illustrates how much used oil would be saved if every driver in the United States switched to Mobil 1 Annual Protection. The sustainability initiatives of Mobil 1 extend beyond NASCAR Race to Green. Since 2004, ExxonMobil has supported Earth 911 to help consumers with the challenge of properly disposing used oil. Through its website, www.Earth911.com, consumers can find information about reducing, re-using and recycling their used products, and identify nearby locations specifically for used oil collection. For additional tips on responsible used oil recycling, visit www.MobilOil.com. *Calculation based on average U.S. vehicle engine oil sump size, average U.S. oil change interval and average U.S. annual driving distance. Assumes new vehicles under warranty follow OEM recommend oil change interval. 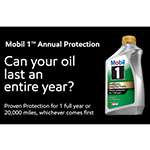 Mobil 1 Annual Protection is guaranteed to protect for one full year or 20,000 miles, whichever comes first. Racing provides the Mobil brand the ultimate testing ground to improve the technology in our range of oils and lubricants. Through each race season, our advanced products go to work in race cars to help improve their performance and efficiency. Mobil 1™ motor oils serve as the lubricant of choice for many of the world’s top race teams who compete in the most demanding and popular motorsports series in the world. The knowledge we gain through these partnerships is integral to how our scientists and engineers develop technologies and constantly push the boundaries. For more information, visit: www.mobil1racing.com. American Medical Response, Inc., America’s leading provider of medical transportation, provides services in 40 states and the District of Columbia. More than 25,000 AMR paramedics, EMTs, RNs and other professionals work together to transport more than 4.4 million patients nationwide each year in critical, emergency and non-emergency situations. AMR, a subsidiary of Envision Healthcare Corporation (NYSE: EVHC), is headquartered in Greenwood Village, Colorado. For more information about AMR, visit AMR.net and follow @AMR_Social on Twitter.